marital bless: There was an accident. Everything is just fine now, but it seemed quite appropriate that I was so unsettled the past few days. 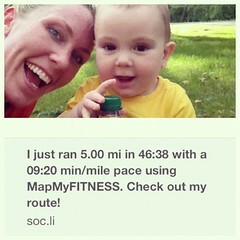 Last night, I ran my 5 very sore, miles in the beautiful evening. 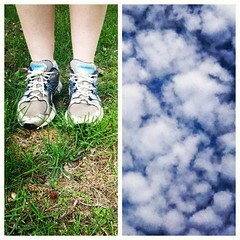 I felt awful while running, but still managed to keep a pace that I was happy with. Tony and the boys were outside, as Tony finished putting up the accessories on the swing set. As I walked back to them, I could hear Isaac jubilantly shouting "You're the best Daddy ever!" I asked Tony if he'd told Isaac to say that and he said that nope, Isaac had just been saying it repeatedly. It was amazingly sweet, especially when he followed up with "You're a great Daddy." 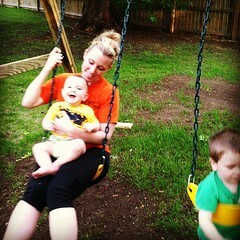 I spent some time outside with the boys, before Ezra made it very clear he wanted to nurse and I left Tony and Isaac outside on the swingset. I was even wondering to myself, what Tony's next project would be, since he was finishing up the swingset. Several times, Isaac came to the side door to request something or the other and I let him in, only for him to return to the backyard. After an hour or so, I decided to hop in the shower with Ezra, who is quite content to just play with toys at my feet while I get cleaned up. I had the fleeting question, as I climbed into the shower, whether I should tell Tony my plans, in case Isaac came to the door while I was unavailable. I really should have heeded that prompt. Just a few minutes later, with sudsy hair and soap on my body, Tony bust into the bathroom yelling my name, while Isaac was hysterically crying. There was an accident. Isaac fell off our concrete steps and somehow got a gash and egg on the back of his head. We're not sure if he fell on the toy truck he was holding or if he managed to land on one of the corners of the steps. He was screaming "Mama!" and I wrapped myself in a towel, soap and all, just to hold my baby, as Tony checked out the damage. Thankfully it did not need stitches and quickly began to clot. Our poor little bud. It is just awful to see your child's blood. We're so thankful that it wasn't worse. Thank you God for your protection. Tony knows his next project now. Somehow replacing the wrought iron hand rails he removed last year and how to apply padding everywhere our kids set foot. Well, that's the most awful thing in the world. Poor guy! And poor mama! Oh the heart hurts reading this, but I'm glad that it turned out just fine. Seeing your child's blood is just awful. We experienced something like that last weekend and it was painful. And I'm glad you are too. poor little dude! Glad to hear he is ok! Oh, I'm so glad all is okay and nothing worse happened. I'm so glad it wasn't worse and Isaac is okay. UUGGGHHH!!! So glad he is ok.
Poor guy. I'm glad it wasn't worse than it was. SO glad he's okay. Poor little man. How's he doing now? I'm so sorry that had to happen, but so thankful he turned out to be okay. It's never easy to see your child hurt. I'm so glad he's okay! Don't you wish you could wrap your kiddos in bubble-wrap sometimes?! ick, it definitely could have been worse but still it's so horrible to see them get hurt. Nothing like that rapid heartbeating in your head when you know your child is hurting. OMG my heart dropped reading this (been off the grid with the flu for several days now). So glad this was not serioous. Your premonition was spot on, Leah - isn't is funny that as a mom we RE suddenly granted the power to see into the future? Hope Isaac is feeling much better now.